Since the implementation of mandate by the Reserve Bank of India to accept only CTS-2010 compliant cheques for clearing, the Cheque Scanner market in India has witnessed profound growth. In usage by the traditional brick and mortar bank branches as well as by the automated Cheque deposition kiosks, Cheque Scanners forms a key component of the Cheque Truncation System implemented by the RBI to reduce the time period of Cheque Clearing Cycle as well as reduce the circulation of fraudulent cheques in the banking system through multiple stage scanning. According to 6Wresearch, India Cheque Scanner market is projected to grow at a CAGR of 5.6% during 2017-22. 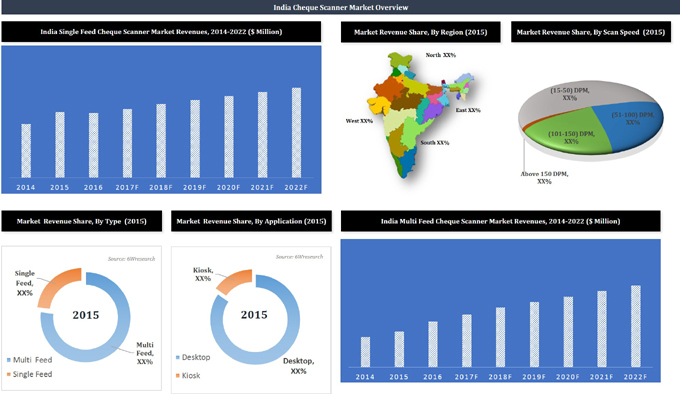 India Cheque Scanner Market is forecast to grow due to manifold increase in demand for single feed cheque scanners which can be incorporated into Cheque Deposition kiosks to scan the deposited cheque and produce receipts. Further, commercial bank branches are also set to rise in the near future with the focus now shifting towards Digital Bank Branches to increase the efficiency and reduce cost of operation. In Multi Feed Check Scanner category, banks have emerged to be the highest user of these with majority of the scanners being used as Desktop Cheque Scanners to be operated by a bank teller. In Single Feed category, the majority of the scanners were installed in the cheque deposition kiosks. India market report thoroughly covers Cheque Scanner market by types, applications, specifications and regions. The report provides an unbiased and detailed analysis of the on-going trends, opportunities/ high growth areas, market drivers which would help the stakeholders to decide and align their market strategies according to the current and future market dynamics. 13.1 Canon India Pvt. Ltd.